Kelly Swanson – – Thanks, everybody, for calling in. We really appreciate it. This call is to talk about this fantastic undercard, the undercard for the Adrien Broner and Marcos Maidana fight, which is December 14 from the Alamodome in San Antonio. We’re going to start off today with Cesar Seda and Leo Santa Cruz, and then immediately following their comments and your questions for them, we will turn it over to Keith Thurman and Jesus Soto Karass. To get this call going, I’m going to introduce Richard Schaefer, Chief Executive Officer of Golden Boy Promotions. Richard Schaefer – Thank you, Kelly. Before I get started to talk to about this sensational card, I just want to make another quick comment. There were some great fights this weekend. We had pound-for-pound great Andre Ward looking quite spectacular in defending his world title, but there was another fight which really stole the weekend. We had Kelly Swanson look more than spectacular in her first victory. I know she said it’s going to be a one-off; I’m trying to talk her into signing with Golden Boy and have offered her a very lucrative contract. We’ll see, but she was just devastating in her amateur debut this past weekend, so congratulations, Kelly. Talking about devastating, this is the best card we’ve ever put together in a very long time. It’s Broner and Maidana, but it’s not just Broner and Maidana, which really I believe is still a pay-per-view-worthy fight, especially if you team it up with three other world title fights – Keith Thurman and Jesus Soto Karass, Leo Santa Cruz and Cesar Seda, and Beibut Shumenov defending his his light heavyweight title against Tamas Kovacs. For this card to be able to be enjoyed for free, live, on Showtime, is just absolutely spectacular thing. I want to say a big, big thank you to Stephen Espinoza and everyone at Showtime and CBS Network for coming up with the required financial contributions to get this fight card going. I want to thank very much, as well, our partners in San Antonio, Mike Battah and Jesse James Leija from Leija*Battah Promotions. They’re doing a terrific job as always. We have scaled the Alamodome for 30,000 people and there are well over 10,000 tickets sold already. Ticket prices are available for as little as $10, as little as $10. I mean that’s less than a movie ticket -$10, $25, $50, $75, $100, $150, $200, and $250. I think that the $250 is already sold out. Make sure, write about, tell your readers and listeners and so on that this great, great fight card, for as little as 10 bucks, you can go and enjoy. I want to thank our sponsors Corona, AT&T, and our latest edition, Casamigos Tequila, a fast-growing tequila brand which a celebrity-owned tequila company owned by George Clooney, and Grudge Match, the great movie, which will be in the theaters on December the 25th. I want to thank all of the sponsors. The fight will be televised live on SHOWTIME CHAMPIONSHIP BOXING, beginning at 8 p.m. Eastern, 5 p.m. Pacific. I really can’t wait for all of those fights, even the non-televised portion, with Ricardo Alvarez, Saul’s brother, Jamel Herring, Robert Easter, Rau’shee Warren. It’s an all-star lineup. There is a special other treat there, Jermain Taylor will be fighting against J.C. Candelo on that card as well. Really, a terrific lineup. A little bit of everything, and I think the perfect ending to what I consider to have been the best year of boxing since I’ve been involved back in 2000. Just an absolutely terrific year with great, great fights. Talking about great fights, we have today Leo Santa Cruz and Cesar Seda on the call. This is the classic Mexican/Puerto Rican matchup. Cesar Seda has a record of 25 and 1 with 17 knockouts. He’s from San Juan, Puerto Rico, promoted by Miguel Cotto Promotions and Golden Boy. He won the WBA Fedecaribe and NABO titles before having his one loss, which was against WBO Champion Omar Narvaez in 2011. Since then the 27-years-young Seda has gone up in weight and won five bouts straight, two by knockout, earning him the opportunity to fight for the world title against Leo Santa Cruz on December 14th. It’s a pleasure for me now to introduce to you, Cesar Seda. First of all I want to thank Oscar and Richard for this opportunity. I also want to thank Leo Santa Cruz. This is the fight I was waiting for. This is the fight that I’m going to prove that there is still a lot of talent in Puerto Rico, so thank you very much. Great, thank you. I’m going to be introducing you to now a fighter who doesn’t need much introduction. He is one of the most action-packed fighters in any weight class. He has a record of 25 and 0, with 15 KO’s. Originally from Huetamo, Mexico, now living in Los Angeles. He broke into the international boxing scene in June 2012 when he won the IBF Bantamweight World Championship with a unanimous decision over Vusi Malinga. Then he went on to defend the title three times in 2012 with exciting wins over Eric Morel, Victor Zaleta and Alberto Guevara, the last one being the highest watched boxing event over the last 12 months. It was aired live on CBS network following the Butler-Indiana basketball game. Over 1.8 million homes were watching that fight and really elevated Leo Santa Cruz to even higher levels. He then faced Alexander Munoz on May 4th in Las Vegas on the big card, with Mayweather and Guerrero, and then with a TKO, where he won with a TKO in the fifth round and continued his undefeated record. Most recently, Leo Santa Cruz earned the WBC Super Bantamweight Championship after a knockout win over former champion Victor Terrazas at the StubHub Center in Carson, Los Angeles. As I said, his accomplishments in the ring are absolutely amazing, but outside of the ring, as I said so many times, he really is one of my favorite fighters. He’s just a terrific, terrific young man and it’s a pleasure for me to introduce to you the WBC Super Bantamweight World Champion, Leo Santa Cruz. Thank you, Richard, for all your words. They mean a lot to me. Thank you very much. I want to say hello to everyone and I also want to thank Richard, Golden Boy, Showtime, my manager Al Haymon, to the other people that have been making this possible. I’m just happy and I’m ready. I’m ready for December 14th. I’ve been getting ready already like for a month and a half, two months. I’ve been training and I want December 14th to come so I can show everybody … and what I got. I’m very motivated and ready for December 14th. Great. Thank you very much, Leo. We are going to open it up now for questions for the media. If you guys have any questions for Leo Santa Cruz or Cesar Seda, please go ahead. Yes. I have questions for everyone, but first, Kelly, I just want to congratulate you on all of your success this weekend and just for everything you do in this sport. I mean, this is just one more footnote. It’s really inspiring. You’re very welcome. First my question is for Richard. Richard, this card in San Antonio, I’m not quite sure how to word it, but has this motivated other cities to get in touch with you, because you’ve really helped build San Antonio into a fight town. I just want to know if the plan is just to look for other areas in 2014 to keep it going throughout the country? We started to host fights in San Antonio when we did some of the Fox shows and this has been a process with James and with Mike for the last couple of years, and then obviously, the goal was to bring big fights, world championship fights, on a regular basis. The key word here is “regular basis.” That’s how you develop the market. Obviously with the kind of turn out we have, it has worked. We’ve done exactly the same in Brooklyn, New York, where a lot of people felt like a West Coast Los Angeles-based promotional company, how can they capture that market? But the key word again is consistency, and to have partners in those markets which share the same vision and are passionate about the sport. With Mike and with James we have those partners in Texas which are passionate about the sport and are willing to invest in the sport as well. The same is true for the Barclays Center with Brett Yormark, the CEO, passionate about the sport. The same is here at the Staples Center with AEG Dan Beckerman, the CEO of AEG is passionate about the sport. That’s why you’ve seen these markets develop the way they are. There are many other markets, which I believe are waiting to be hosts on a regular basis for boxing. It’s a matter of finding the right local promoters and friends and partners to develop those markets. For example, I can see a Chicago being one of the next targets for us, but again, we want to have the right partners, loyal partners, who want to work with us. Okay, thanks a lot, Richard. That was a fantastic answer. My first question, Cesar Seda, I know you moved up to 122 a couple of years ago. I just want to know what difference it’s been for you since moving up from 115 and if there is anyone you’ve fought that you feel compares to Leo Santa Cruz in terms of the volume of punches that he throws? I moved up in weight kind of like Leo did. Leo was the champion at 118. He moved up to 122. I also moved up. I kept my eye on him and the truth is, I feel a lot stronger at 122. I feel a lot stronger and I’m going to prove it on the night of the fight. As far as Leo’s style, no, I’ve never fought anybody that throws so many punches, but I have fought guys that are very strong, aggressive and punchers. I want to prove that I have the talent and the power to beat a Leo Santa Cruz and to compete in this division. It’s the most important fight of my life. Cesar, you noted earlier that he wants to prove that there is plenty of talent in Puerto Rico. Does that add any pressure to this fight? No, not at all. In fact, it motivates me and gives me hunger. Right now, in Puerto Rico, there are not too many champions. There aren’t too many champions and I want to prove that we have the talent and we can compete and be champions. I have hunger and I can’t wait for December 14th. Cesar, thanks a lot. Leo, I kind of have the same question for you, just how you feel since moving up to 122. You had a spectacular year last year, but I noticed against Guevara, you kind of looked a little sluggish. Was it just because you fought so much in 2012 or was it just that it was time to move up in weight? No. I think at 122 I feel stronger. I feel better. Everything’s good. I didn’t have that much problem going up, making 118. The only thing that, for the Guevara fight, it was I fight in November and then in December again, it was-it seemed like a month. I didn’t really have that much time to train and probably my body was tired. I didn’t let my body recover. I think that was the main primary concern; I didn’t let the body rest. That’s why I looked kind of tired and sluggish. Other than that, I feel stronger at 122 and I feel stronger. The weight is way. I feel strong and inspiring. I feel great now. My first question is for Cesar Seda, picking up on what he said about Puerto Rico not having any champions, how much pressure does he feel given that he’s fighting a really tough guy in Leo Santa Cruz, with all that that’s gone on with the Puerto Rican fighters? No, no pressure at all. That’s what we’re working hard for. We’re working very hard in the gym. We’re working very hard in the conditioning, strengthening, and remember I fought Narvaez. I lost my undefeated record to him and that gave me a great deal of experience. Yes, I wanted to pick up on that. Narvaez is more of a crafty fighter. Can he compare and contrast what he thinks he’ll be able to do with a guy like Santa Cruz, who comes to you and will be there, maybe allow him to use his southpaw skills. We learned a lot from that fight. You have to understand, Narvaez had tremendous experience, a great deal of experience. He was an Olympian, and during the fight, we were winning. We were comfortably ahead of the fight, but then they started deducting points, calling low punches, and that frustrated me a little bit and made me look for just one punch. We learned a lot from that, gained a lot of experience, and that will show come the 14th. Leo, many of us who have been watching you, we just come to expect an exciting fight from you every single time out. No different this time. Do you embrace that pressure? Do you embrace that and does it make you fight better, or do you feel some pressure? Yes, that’s why I train 100% in the gym. Every time I work harder. Every time I try to improve, I try to improve because I know that the fans, that’s what they want to see. For me to go and do what I always do, I have to train 100%. I have to dedicate and that’s what I do. I’m always – most of my time, I’m in the gym. In the morning I’m in the gym, and then I go home, eat, rest, and then I come back. I do my strengthening and conditioning. We could say that I live in the gym because I like to please the fans. I like them saying good things about me, and when I go out there I like to give them a great show. I never want to disappoint them. I try my best not to do that. I try my best to be at 100% and that’s what I’m doing right now. Obviously, you saw what happened to Abner Mares and he feels the same way. He felt like – even when I asked him, should he have held on when he got back up? He said no, you got to understand, I’m a fighter. Your reaction to his loss? I know you thought maybe you would fight him someday. What is your reaction to his loss, and does that make you understand the sudden nature of this sport and how it can turn on a dime? Yes. I was surprised. I couldn’t believe that he got knocked out. I thought he was going to win, that’s why. But things happen and it didn’t really affect me. It was just like a quick knockdown to fight him. We don’t know how it would have gone if it would have gone the distance. Maybe he would have won, or at that point, he wouldn’t have come. Maybe … to happen between me and him and nothing has changed it. I think we … fight. Last question for you. When was the last time you fought a southpaw? I was trying to look at your record. Do you think his style will be at all difficult for you? Yes. Southpaws are more difficult, their style. But the last time I fought a southpaw was Vusi Malinga. That was when I won the IBF Title. I could fight southpaws, too. I could get used to their style and I’ve been fighting southpaws in the gym. I’ve been practicing hitting to the right and I’ve been doing things that how you have to fight a southpaw. I saw where on the Texas Department of Licensing and Regulation website, you already have half-a-dozen dates reserved for next year. That indicates you have a lot of confidence in this market here. Talk about how that came about. I think you touched on it earlier, talking about Mike Battah and Jesse James Leija. What is it about this market that can support that kind of activity? San Antonio was always a good market for boxing, but I think what we’ve done, together with Mike and with James, we really have taken it to a totally different level. When I was, a couple weeks ago, in San Antonio with all the fighters to do the press conference, I had mentioned it right there when I said that, and I really mean that, that there is Las Vegas – and I’m not listing these in any particular order. There is Las Vegas, the MGM, obviously. There is the Staples Center and the StubHub Center in Carson, Los Angeles. There’s the Barclays Center in New York and then there’s the Alamodome Antonio. I really believe that San Antonio fits and belongs in that group of premier fight towns in the United States. For us to have been able to develop the market the way we have, with our local partners there, with Mike and with James, it’s obviously fantastic, and I that’s why we are holding a number of dates for San Antonio. The continuity is extremely important and we want to continue to bring big world championship fights to San Antonio. One of the fights, who I mentioned that at the press conference as well, who made it clear to us, who wants to fight there again next year is Saul “Canelo” Alvarez. He felt extremely comfortable and welcomed in San Antonio. It’s a great fan base and it’s great that you come to San Antonio. How much did his fights against Trout, Austin Trout, play into this when it drew 40,000 people? Did that really cement San Antonio on the map? I think it was more than that. You look at Dallas, which had hosted a Pacquiao fight, and then you pretty much don’t hear anything about Dallas anymore where he won it was a one-off. Or you remember when Oscar fought in El Paso and it was a huge crowd. I think those big fights are important, but one-offs really are not. You cannot build a market with one-off events no matter how big they are. Those one-off events, they don’t do anything. Are they important in the scope of the entire year, where you’re going to bring smaller fights and bigger fights? You need to bring a mix of everything and that is ultimately much more important than that one-off big fight. Finally, how important is the Hispanic market in this town, and in boxing in general, in driving the Bedrock of Boxing? Are they still the most important element? Oh, absolutely. I think the Hispanic market is extremely important to the help of boxing. We recently had commissioned a study from the leading research company in the United States, Carrboro Research, which is, they work with Fortune 500 companies. We have commissioned the research, an independent research to ask them about the demographics of boxing and how boxing is perceived. And the fact that the Hispanics are important, but I have to tell you, the urban market, the African American and the urban market, is almost equally important. I think a lot of people have not really realized that. But there is a reason why a Canelo fight against a Mayweather fight, where you have an urban, African American fighter with Mayweather, and a fighter who has a lot of overall, general market appeal, and you have him against the most popular fighter from Mexico, Canelo. You have those two and they break all sorts of records. There are – I think boxing, it’s the Mexicans … the Latinos. It’s the urbans, but more and more, we see that the general market is getting really behind boxing again in ways we haven’t seen it before. We see that with increased sponsor commitments, but we see it as well with the ratings on Fox Sports Life, the Monday night boxing series, which several of those dates are, and will be, in San Antonio as well. The ratings Fox is getting is double, and I’m not making this stuff up, it’s double what they expected. Boxing as a sport, I think, has really had a huge, huge comeback year in 2013. The biggest I’ve seen. I think San Antonio is a big, plays a big role there, because if you can bring fights to those kinds of venues like San Antonio has, like the Alamodome, or the basketball arena, and all those, and the smaller venues as well, you basically elevate the sport, and I think that’s what has happened this year. Yes, sir. Richard, I guess we’re echoing the same sentiment in reference to San Antonio being a hotbed for boxing, and definitely your undercard is very impressive with Leo Santa Cruz and then Keith Thurman fighting Jesus Soto Karass. That particular, the last fight that you all had in San Antonio with Omar Figueroa on the undercard, it turned out to be something absolutely amazing. Absolutely. You saw the Omar Figueroa against the Japanese kid, Arakawa. That was like a fight-of-the-year candidate. It might very well be the fight-of-the-year, just an absolutely fantastic fight. So yes, you have great local talent in San Antonio, which is coming along, and Mike and James are doing a terrific job there to keep the pipeline going. I think what it does as well, for a market, when these young kids, who are training in the gyms as amateurs, and they see that boxing is coming on a regular basis to their town, that encourages them as well to train even harder, and eventually hopefully sign with a Mike Battah and a James Leija, and then with the Golden Boy. I think that’s a big motivator as well, and the big benefit of having big cards on a regular basis in a particular market. I think all that is very encouraging. I think it helps to really grow the sport as well from the roots up, by giving these amateurs something to look forward to when they turn pro, that they can fight in their home towns. Yes. And, Figueroa, of course, is from the Texas Valley. There are good gyms. Leija and Battah are doing a great job of finding that talent and trying to encourage kids to go into the sport of boxing. But, I just want to commend you on – it’s going to be tough for you all to get undercards such as the last two or three that you’ve had. You’re going to have to outdo yourself there. We like that. We like to outdo ourselves. When you look at this card, you have a Broner and a Maidana as the main event, but all the other fights are main events in their own way. How is it that over 10,000 tickets are sold? That you’re going to have between 20,000 and 30,000 people there in the Alamodome? That doesn’t just happen. I just want to quickly spend a minute on, how does that happen? With Mike Battah you have – with James Leija, you obviously have the legend in the market who understands boxing and knows boxing, and boxing knows him. But then with Mike Battah, you have one of the most successful business people and entrepreneurs there from the San Antonia area who is passionate about boxing, being fully dedicated to the sport. What he does is he takes – when we bring these big cards there, he takes one of his warehouses, hires like 60 people, puts in 60 desks and phones lines, and so on, in a big warehouse. Those 60 people are, from the morning til the evening, nonstop on the phone, calling people, selling tickets, getting sponsors involved and creating a hype. That is what I call putting the money where your mouth is. That’s Battah. That’s Mike Battah. Just an absolutely amazing guy who has a passion for the sport and what he is doing is really, it’s just great, great, great for San Antonio. Hi. My first question is for Cesar Seda. Cesar, do you feel you can win a decision in San Antonio, considering that it’s going to be Leo Santa Cruz throughout, and sometimes when that happens, every time he throws a punch or lands a punch, people go wild. Do you feel you can win a decision in San Antonio? Yes. We know and we understand it’s going to be pro-Santa Cruz, but there are ways to get around that and to keep the crowd out of it. The question is for Leo. Leo, what do you think are the strengths and advantages that Cesar has? I know that he’s a very good fighter. Seda is a very good fighter. He has all the qualities to be a champion. He’s a good boxer. He’s a good puncher. He can box, punch. He can do a lot. But I’m training very hard. I’m training very, very hard, and like any good Mexican, I’m going to fight against a Puerto Rican, and you’re always going to get a war. I’m preparing very well for this fight. May the best man win. Richard, first of all with you, being at Fox and really the national TV scene no more, like the ABC and NBC and stuff like that, and even though you have set up these for Fox Sports and for those who have cable can watch it. Is that one of the terms why you all decided to bring the ticket prices down like $10 to $20; because it’s working? Are you all going old school with the prices to help those that can afford a little bit more to come out and see, and show more support? Well, you want to create an environment where people can take a family and they can take their kids, and the kids can get excited about going to a big boxing event, sporting events. Some of the baseball stadiums once in a while you do have these cheap tickets, but other than that, there are very, very few sporting events, period, where you can go and get for $10 to go and see a world championship fight. Now, let alone here, we’re talking about four world championship fights. So from a pricing point of view that must be setting a record in itself. I think pricing is important, but we didn’t really have to go as low as $10. I mean, we could have gone with $20 for cheapest ticket, and it still would have been extremely inexpensive, but we really want to make a point here that, don’t blame it that you can’t afford it, and if you’re a family of four or five or six for 50, 60 bucks you can go and take your family there, and this is what we wanted to do, and that is what we’re going to continue to do. And when you go to those bigger venues, then you have the advantage as well that you do have the ticket inventory, the seat inventory to accommodate fight fans, and I think that’s all part of the Golden Boy story, to really bring boxing back one fight at a time. Cesar, the question I have for you was, in your loss to Omar Narvaez, what did you learn from that fight that’s going to help you in this fight? What I learned from that fight is to keep my rhythm, and to keep my game plan, basically. Don’t get discouraged and just keep the game plan and keep the rhythm and volume of punches. Right, and with that, Cesar, you’re pretty big for bantamweight, super bantamweight at 118, 122. With that, you’re 5’6″, but Leo is actually an inch taller than you, and got the same-pretty good reach as you. How do you plan on out working and out punching Leo, because he’s merciless when he gets mad; it’s like he doesn’t stop punching? Yes, I have the tools, the smarts, and the ability to beat a fighter like him, and you’re just going to have to wait and see on December 14th. Right, and last question is for Leo Santa Cruz. Leo, if anybody who watches Cesar Seda knows that he’s a precision body puncher, and even though a couple times a ref will take a point away saying he hit kind of low, do you go back and replay it; he does hit kind of close to the belt line, but he’s really good at taking that body out. Do you expect him to do that to you; to take you out and keep you in the deep waters? And what do you feel about him being almost as tall as you, as well as a long-arm reach as you? I like fighting taller guys than me or the same as me. I think it’s easier for me to resist them and to go out there and fight better, because I have trouble with shorter people, and it’s a lot difficult to fight shorter people if it’s hard when they move a lot, and it is hard to find their head. But to fight somebody as tall as me and almost the same, I think it makes a much better fight, and is better for both of us because we see the fans and we give them what they want, a better show, and if he comes with the body, I think it’s going to be even better for me because I like people to stay there in length, and if he does that, we’re both going go at it and give it a war. I think the fight is not going to finish, not going to go the distance, not going to go to 12 rounds if he stays there and tries to go to the body, I think it’s going to go the distance, going to finish before the 12 rounds. Great. Okay. Thank you very much to the two fighters, to Leo and to Cesar. We’ll see you guys in a few weeks down in San Antonio. Continue training hard, and I know it will be a great battle. I know that Cesar Seda is coming to win the title, and I know that Leo Santa Cruz will be in great shape, and will continue to build his legend as one of the best fighters in the sport. So with having said that, we are going to be moving on now to the semi-main event. Well, when I was talking about fights, I like to see, this one is right there. I mean, Keith Thurman against Jesus Soto Karass is, I think, a fight fans, a sport fans dream. With Keith Thurman, we have one of the most devastating knockout artists in the sport, and with Jesus Soto Karass, we have a fighter who has turned around, his career is flying high, and is building win after win after win, and fighting for a world title here now against Keith Thurman is the payoff he has been waiting for. First, I’d like to introduce to you Jesus Soto Karass from the Mexican boxing hotbed, Los Mochis, Sinaloa, Mexico, clearly one of the most respected veterans in the sport. He had some classic fights over the last few years, going toe-to-toe with the likes of Marcos Maidana and Andre Berto. The Berto fight in July was particularly important for him as the twelve-round technical knockout win was, by the way, his fourth in his last five bouts, earned him the world title he has craved ever since turning pro in 2001. So on December 14th Soto Karass promises that he won’t let his chance at the championship glory slip away. He is ready to show Keith Thurman what he’s all about. It’s a pleasure for me now to introduce to you a true Mexican warrior, Jesus Soto Karass. Good afternoon to everybody. Thank you for having me on this call. I just finished training. I’m training here at the Ponce De Leon boxing gym, and I’m ready, I’m preparing well, and I’m ready for a war on December 14th. Excellent. Thank you. I’m going to be introducing now Keith “One Time” Thurman. Before I’m going to do that, I just want to quickly mention something; I’m reading everywhere that this one fighter is the most avoided one, and is the new superstar and has the highest knockout ratio of any fighter, and is being basically elevated into that status, and I know you know who I’m talking about, Gennady Golovkin, with a knockout ratio of 89.3%. And maybe it’s the old banker in me when it comes to numbers, I figure, I said something doesn’t add up because we have a fighter here, I think, who is as much avoided as Golovkin, and who actually has a higher knockout ratio than Golovkin, and that is Keith “One Time” Thurman with a record of 21 and 0 with 19 knockouts, that’s a 90.5% knockout ratio. So he is-and I know Eric Gomez can attest to that. It’s not an easy thing to find an opponent for Keith Thurman. Everybody sort of like is afraid, I guess, but not Soto Karass. 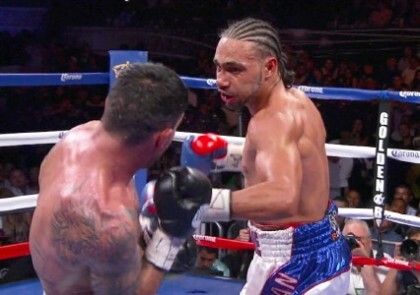 Keith “One Time” Thurman, a former amateur standout which compiled over 100 wins, has been on a tear since returning in 2012 from an injury-forced layoff, and he has made a statement with his trio of recent victories, and here he is on December 14th. It’s always a special treat. You want to make sure you have your popcorn or your beer or whatever you’re going to have. You’re going to be in your seat and you’re going to watch because you don’t want to blink, you just don’t know what happens when Keith “One Time” Thurman enters the ring, and starts unloading. It’s a pleasure for me now to introduce to you, clearly one of the most exciting fighters today in the sport, Keith “One Time” Thurman. Hey, how is everyone doing? It’s a pleasure to be here on the show. Thank you for having me. I’m on my way home from the gym, just put in many rounds of bag, shadow, abs. We’re getting in shape, we’re shedding off that last little bit of belly fat, and I’m looking forward to December 14th. Keith, my question for you, a couple questions for you; when you fought Diego Chaves, and won your interim title in July, it was a really, really good fight and, of course, on that same card your opponent Soto Karass, he fought Andre Berto, and also scored a big win, a knockout, an upset. I wanted to know if you saw that fight, and then what you thought about it, particularly given that he pulled the upset? Berto, of course, was the guy that a lot of people thought would win the fight, but Jesus Soto Karass has pulled his share of upsets in the past. Yes. Directly after my battle I went in the back, I got some ice, I put it on my nose, and I came out to watch the main event, and I saw Soto, I saw his fire and I saw his passion and the warrior mentality within him, and he just wasn’t backing down from anybody. He didn’t care that he was the underdog going into the fight, and he just stuck to his game plan and he kept showing the heart of a warrior, and he pulled up the victory. I saw a very tough fighter in Soto Karass, and I’m expecting the same thing on December 14th. Keith, when you were watching that battle unfold, and watching him take Andre apart, did you think to yourself, you know what, I may be in the ring with this guy soon. I just won a belt, this is my same weight class, we’re both with Golden Boy; that this was a fight that you might see yourself in down the road? Were you taking notes about it, or were you thinking it wasn’t going to happen? I was honestly just watching the fight as it was happening. Because the fight was so close, I didn’t know where it was going to go, so I didn’t have an assumption. This guy might be my next opponent. But as soon as he dropped Berto and it was over, I knew that it was a possibility, and I’ve seen him, in the past, fight fighters like Marcos Maidana, and things like that. So he’s a great warrior, and I’m very happy and excited to step into the ring with himcome December 14th. Alright. One other question for you, Keith. You’re one of the top up and coming welterweights in the weight class. Obviously you’ve been in some exciting fights. We know the kind of punching power that you have. The fight with Diego Chaves was really outstanding. I wonder, from your point of view, how long until you think that you should be, or maybe you already do, should be mentioned to be in the really big welterweight fights maybe against a Broner or even a Mayweather or somebody like that? This fight right here is what we call the icing on the cake. This will get the job done, because after this year no one can say that Keith Thurman has not been tested, that they haven’t put him in with anybody. As much as you want to say that, there’s nobody besides champion. So I’ve been doing my thing, I’ve been passing every test, and I’ve got one more test to pass this year come the 14th being Soto and, after that, hopefully the door will be wide open for that world title shot. Got you. Thank you. I also had one question for Soto Karass. I had a similar question for you as I asked Keith about. I know you were probably getting ready to go into the ring against Andre Berto, but I’m wondering if you had a chance to watch Keith’s fight against Chaves on that undercard, and if you had any thoughts about it, and what his take was on that performance, and did you think maybe you would be, at some point, with a victory against Berto, fighting against Keith in the near future? You know what? The truth is I was preparing for my fight. I was in the locker room getting ready for Berto. I wasn’t really thinking about his fight. Yes, they had the TV on and I was watching a little bit, but more than anything I was getting ready for Berto, and that was-my concentration was for that fight. But it wasn’t until after the fight that I talked to my manager, Francisco Espinoza, and Golden Boy, and the opportunity came to fight Keith Thurman and I said yes. I do what I always do, I prepare, and I’m always ready for anybody, and that’s what happened in this fight. I’m excited for the opportunity. I’ve been waiting for this, and I’m getting ready like never before, kind of like I did for Berto. So, did you finally watch the fight at some point later on and, if so, what was your take on the type of fighter that Keith Thurman is? The truth is, I really don’t like watching video so no, I haven’t really seen his fight. What I do know is that he’s young and he’s strong and he’s hungry, and we’re both pretty much in the same position. We’re ready for major fights. Yes, he’s a world champion, an interim world champion, but I feel that both of us are not going to back down, and we’re ready for the bigger fights, and for the world title fight. So this is a good opportunity for me, and I just feel that I have to win this fight so I can take is back to Los Mochis. The question is to Keith. Richard mentioned that you have over 90% ratio in knockout, but I’ve noticed that actually you can box, you having boxing skills. Do you feel that you have to box against Soto Karass, or are you willing to go toe-to-toe and try to bang it out so you can knock him out kind of like the way Maidana did? I can box, I can punch, and a lot of times, sometimes I’ll have a game plan on do I want to be on the inside or the outside before I even step in the ring. So far, I’m just ready for this fight. I’m ready to plant my feet, I’m ready to throw the big punches. My nickname being One Time, I’m always looking for that one shot. I love ending fights early, I love going home early, and giving fans the knockout that they came to see. So I’m going to bring my best, I’m going to box sharp, I’m going to stay sharp, but I’m also going to be looking for those big punches. The question is for Jesus. Jesus, obviously you understand the kind of fighter that Thurman is, and you feel that if he goes toe-to-toe it’s going to favor you because you’ve been a fighter that likes to go toe-to-toe pretty much your entire career. Yes. Well obviously I’ve been a fighter that’s been characterized as an aggressive fighter that likes to go toe-to-toe, but lately I’ve been boxing a little bit more, I’ve been a little smarter, a little more intelligent, that’s what I’ve been working in the ring. But as always, as always, if it comes down to it, I have the balls to go toe-to-toe if I need to, then obviously it’s going to favor me, and I feel that I’m accustomed to that style and I’m going to do what it takes to win. But still, obviously there’s a little bit of skill involved, and a game plan to be smart, and that’s always going to be in the back of my mind. Just one quick comment for Richard. That’s a great undercard. Thank you very much for putting that fight together. We have really appreciate that. Thank you very much, and it’s my pleasure. First and foremost I’m a fight fan as well, and I love to sit there and watch great fights just like you guys, and that’s one of the reasons why I’m making all these fights. Hey, Keith and Richard and everybody. Two question, one for Richard, and one for Keith. Keith, I’ve talked to you several times. I guess the best word to describe you is unscripted. You really like what you do and there’s no hesitancy in you to stand and fight. You called out Floyd Mayweather two or three fights ago, but what do you like about your job? Really what I like about my job is that it brings the best out of me, also that I’m kind of my own boss. It’s always been my dream to show up to work when you want to show up to work, and clock in and clock out whenever you feel. But besides that, boxing just brings the best out of me. Each day in the gym I’m developing as a fighter just like each day in life I’m developing as a man. So I’m mature in the ring and I’m mature out of the ring, practically almost at the same rate, so that’s the number one thing that I love about boxing the most, is how it brings the best out of me inside and outside of the ring. You’re not shy, either, about kind of trying to take boxing back to the old days where you had Bernard Hopkins, you had Leonard, Hearns, Hagler. You’ve said that you want to be like those guys. Can you talk about how you try to bring that mentality into the ring in your overall approach to how you execute? Growing up in the world of boxing, surprisingly I actually was not much of a boxing fan. It was only once when I started to do my research and my history into the sport of boxing that I fell in love with all the old-school fighters. I mean, practically all of them, you know what I mean? It’s the way that they fought; it’s the way that they handled themselves, and the fact that they would accept anybody. All you had to do was walk up to them in the street and say, “Yo, I’ma knock you out.” And they’re saying, “Where’s the contract? Let’s put one together right now.” So that was the main reason that kind of had me call out Floyd Mayweather on my first appearance on the big network was, here I am, I’m a young dude coming up in the rank, and I’m letting the whole world of boxing know who my actual target is. Doubt me as much as you want, but you are going to watch me through my career climb that ladder, and get to the destination that I first saw, the one that I told you about, and that’s Floyd “Money” Mayweather, and Jesus Soto Karass is one of those stepping stones that I got to get by if I want to make those dreams come true. Richard, when he called out Floyd, what was your initial thought right then and there, and what have you thought and seen in him since then?